Cathay Pacific’s flagship First Class lounge at The Wing at Hong Kong International Airport is now open, after an overhaul so extensive that it’s the next best thing to an all-new lounge. 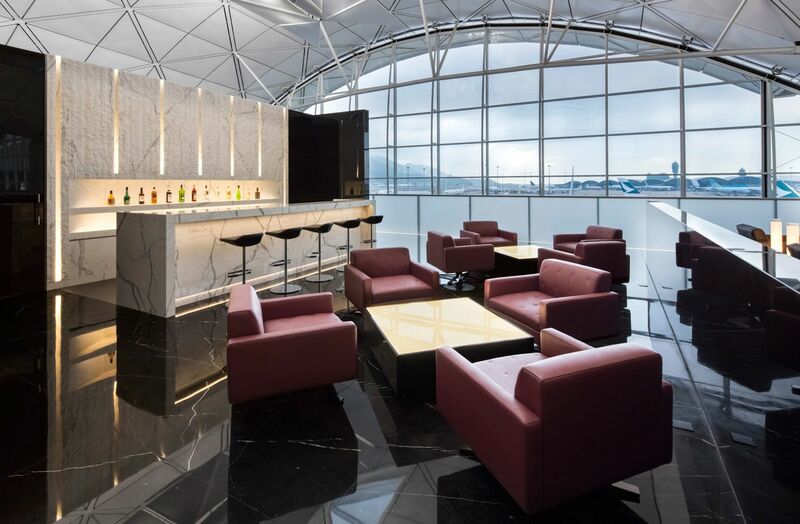 Architectural firm Foster + Partners have created another world-class haven for Cathay Pacific’s premium travellers, following their innovative work on The Cabin and The Wing Business Lounge. 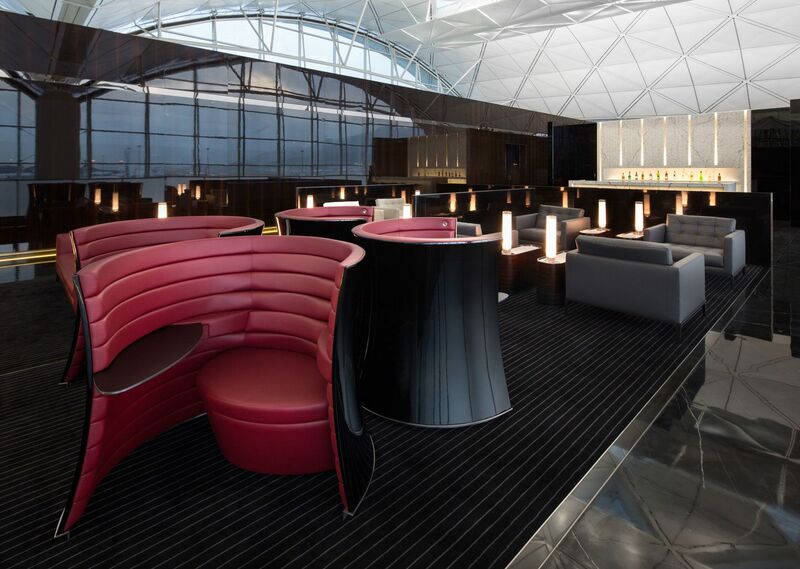 This First Class section of The Wing – located on the upper level (level 7) of Hong Kong airport’s southern concourse, across from Gates 1-3 – is clearly cast from the same design DNA as its siblings but with a stylish and decidedly high-end twist. 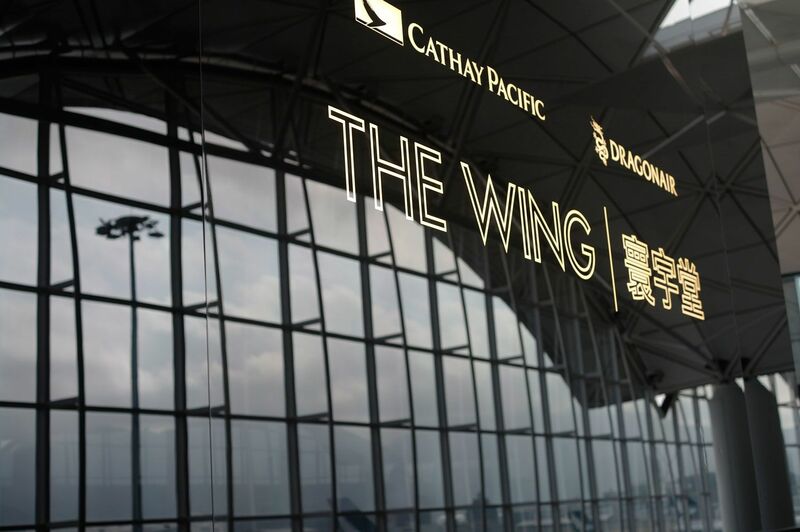 The Wing First Class lounge will be open to the public from 4pm today – and as before, you’ll need to by flying first class with Cathay Pacific (note that first class isn’t available on CX flights to and from Australia) or a oneworld partner, or be an Emerald-grade oneworld frequent flyer. That includes Qantas Frequent Flyer Platinum and Platinum One as well as Cathay’s own Marco Polo Club Diamond. Here’s a quick photo tour at The Wing First Class. 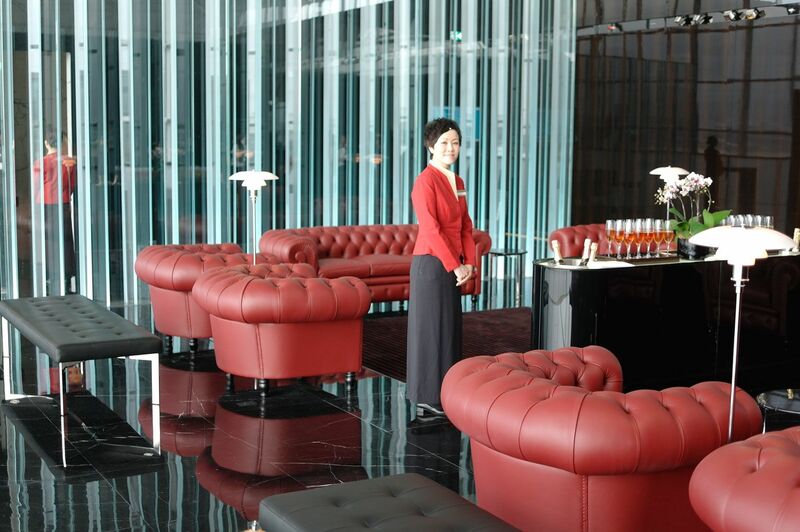 A new element in The Wing First Class lounge is The Champagne Bar, which sits directly beyond the lounge's entry area. 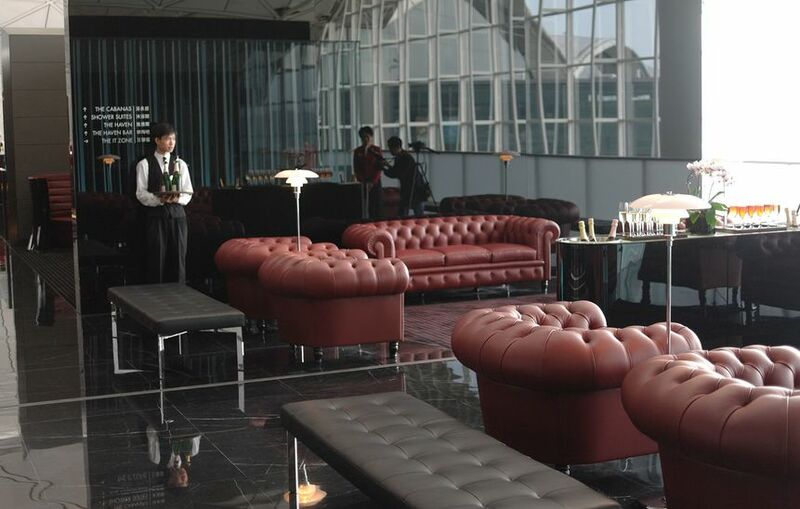 Cathay considers The Champagne Bar as part of your ‘welcome to the First Class lounge’ experience, where passengers will be greeted by staff with a drink upon arrival, before they head to the main part of the lounge. 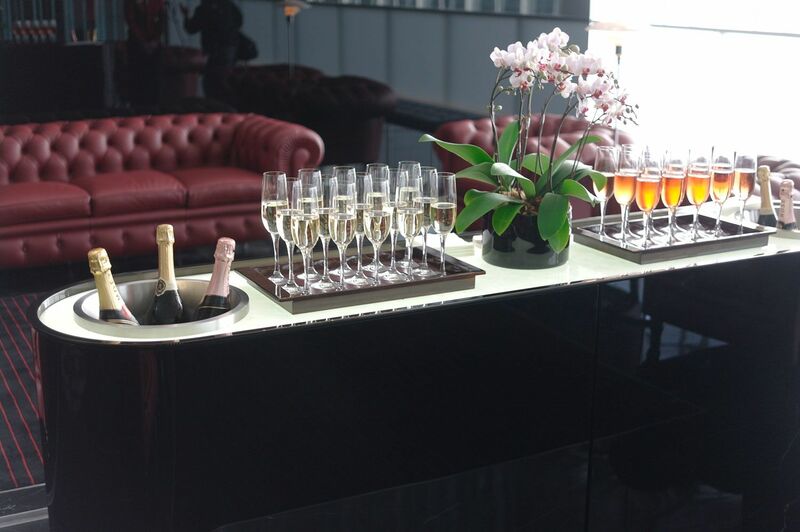 Moet Imperial, Moet Rose and Deutz are the drops currently on offer, although Cathay tells us the selection will be rotated through a variety of champers. The main area of the lounge has been opened up so that total seating capacity is now 167, compared to 123 in the old lounge. It's all superbly high-style, with lush furniture and lustrous finishes. As expected, The Library room has been axed in the make-over – it simply didn't get enough use to warrant the valuable real etstate it occupied. Cathay has retained a small open 'reading nook' near the front of the lounge, although we think the amount of traffic as travellers come and go past this area will prove quite distracting. Of course, The Wing First Class includes those stylish Solus workstation chairs – although these are 'limited edition' ones crafted for the First Class lounge with a high-gloss black shell and burgundy leather interior. Some eagle-eyed readers will have already spotted a bar at the far end of the lounge. This is The Haven Bar, an offshoot of the lounge's Haven restaurant. 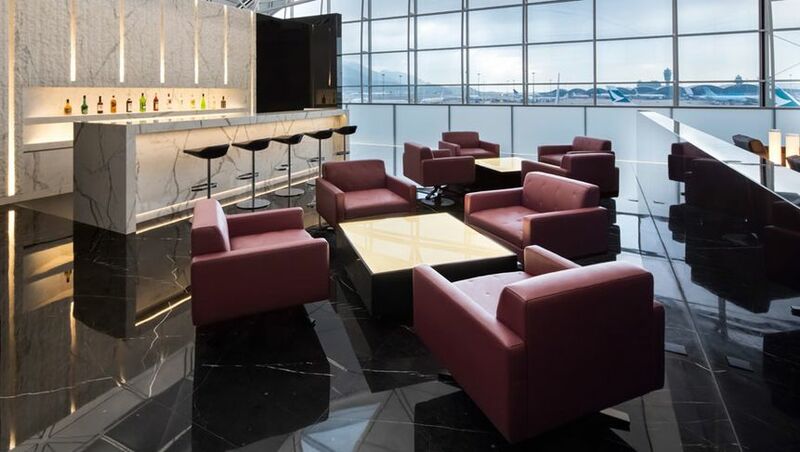 The Haven Bar overlooks the airport’s boarding gates and apron. Anybody for a planespotter martini? Speaking of The Haven, this has long been first stop for travellers, especially in transit – which led to overcrowding in peak times. Those famished flyers will be pleased to know The Haven has been dramatically enlarged, going from 36 seats to 84 seats (some of which sit where the shallow rockery used to run along the edge of The Haven). There’s a “reinvented” à la carte menu complemented by recommended wine pairings, along with an expanded buffet selection. 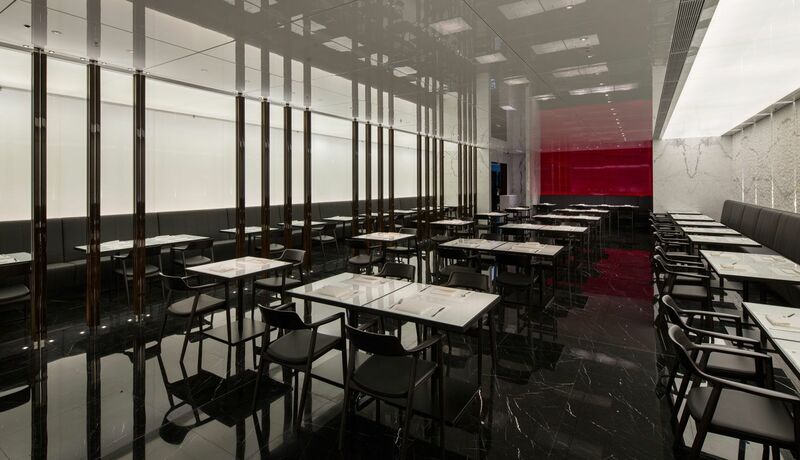 And as before, The Haven is overseen by staff from Hong Kong’s iconic Peninsula Hotel. Long a hallmark of The Wing, these five rooms have also been lushly refurbished to more closely resemble an up-market day spa than an airport lounge! They still boast a spacious shower area with rainforest' showerhead, and indulgent full-sized bath and a couch which doubles as a day bed. But now they're fully enclosed and totally private, rather than the old design in which each cabana faced an open area shared by the rear decks of the other cabanas. Another new touch: an in-lounge ironing service with a turnaround of 10-20 minutes. Each cabana has a closet that's accessible from the outside through a locked door. If you've just stepped off one flight and are heading out on another, hang your shirt, trousers or dress in the closet, press the buzzer and lounge staff will unlock the outside door to the closet and whisk your gear away for a quick press. And there's still no time limit on the cabanas, so once you grab one it's yours until your flight leaves. Nor is there an option to book them – so first in, best dressed (and most rested). 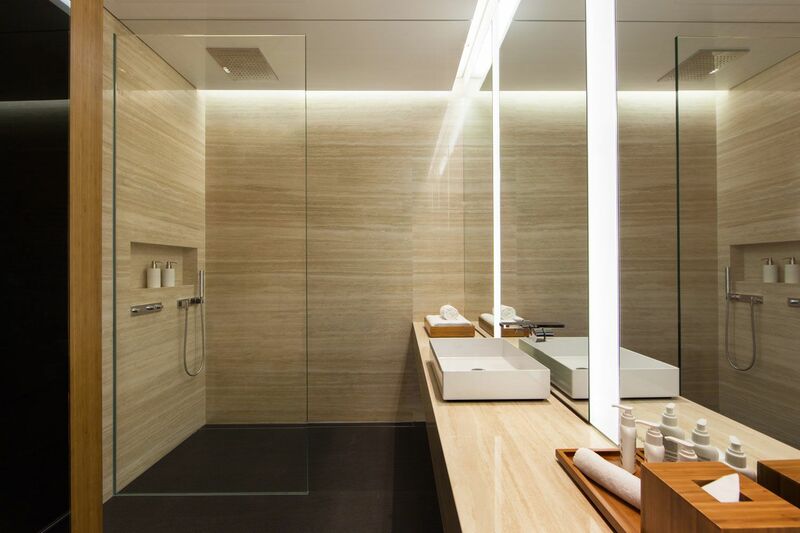 If you can’t snare a cabana room but still need to freshen up, head for one of the shower suites. The Wing First Class used to have just three shower suites, but now there are 12. Keep up to date with the latest news for business travellers and frequent flyers: follow @AusBT on Twitter. as pointed out by CanucksHKG on flyertalk! Yeah, I was madly bashing out the text in the lounge (even skipped the fancy media luncheon!) to get this story up and 'there' is not flagged by spell-checkers! are you doing a report on the CX new regional business class as well?? Can't wait... will be here in less than 12 hours! Hopefully grab some happy snaps for you Dave! A nice quick zip through The Wing. Definitely a nice new modern uplift with a nice contemporary touch. Unfortunately wasn't able to try out the new Cabanas.. Would have enjoyed a nice shower after a red eye flight. The lounge was a buzz with people with what seems like increased seating there wasn't trouble finding a place to sit. The Haven on the other hand was still at full capacity, only a short wait and a table for two freed up. Definitely needed the additional seating. Food wise I found not much difference for the previous Wing however still a good selection. Unfortunately also, probably a bit too early but the champagne welcome lounge was not used and there was no drinks offered, but the bar was in full swing. Apart from the Moët, everything else looks spectacular! Hopefully can book a Cabana for my 8 hour layover in 3 weeks. 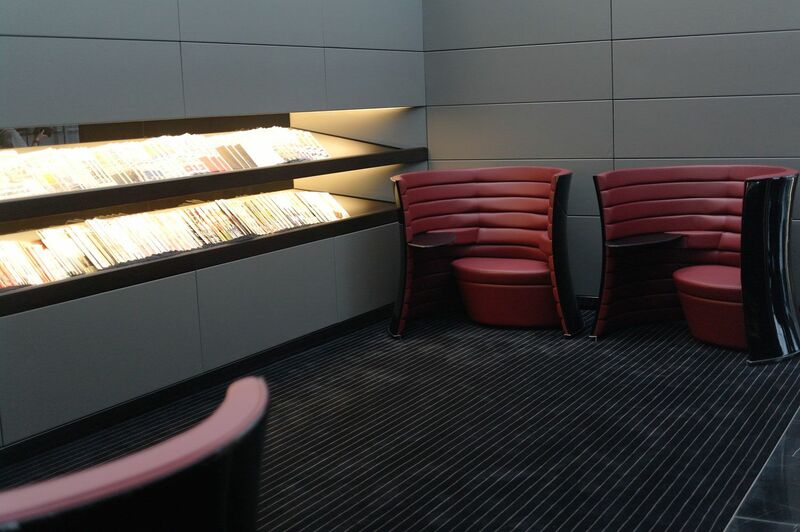 However, I still would rank (based on the photos of The Wing) the Qantas First Lounge in Sydney the best! Sorry Cathay! 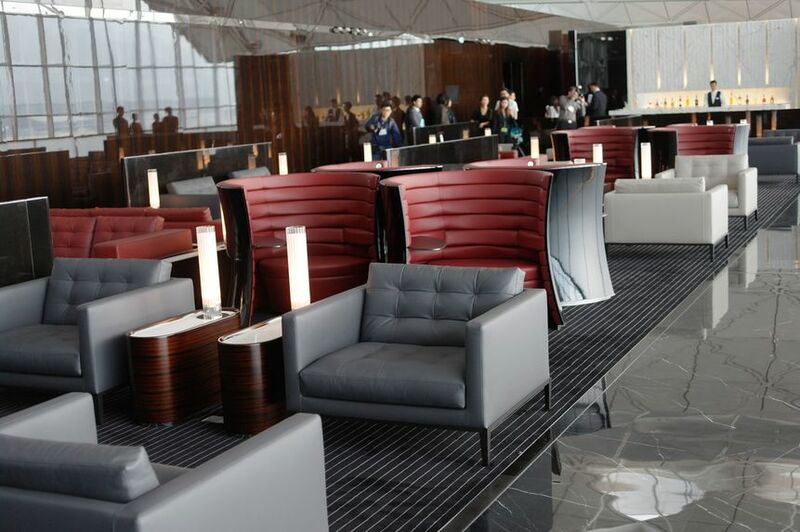 yeah-based on the photos and apart from the Cabanas the QF lounge seems more warm, welcoming and Homely! The CX one seems very glossy ,striking and sharp and for a lounge I think warm and homely wins. I agree. 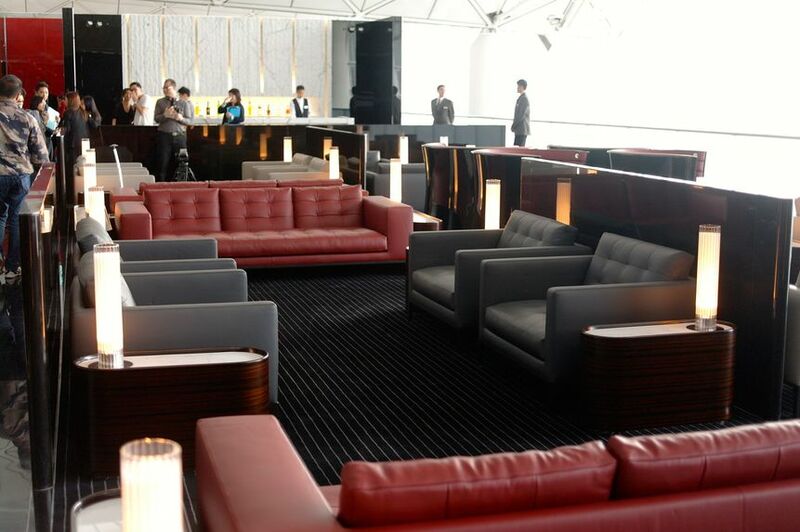 It actually looks quite cramped and lacking in intimacy/privacy which is what most people look for in a First lounge. I'm sure that I'll manage though! It looks pretty spectacular in the photos. Gorgeous! Absolutely gorgeous! Thanks AUSBT! The Cabanas look great, even better than before. Hope it won't be too hard to get one, with only five available. I can easily see myself spending an hour in there. Any with experience with the old ones? Hey Spinoza... the old Cabanas were quite nice too, but as the article mentions, they had a semi-open 'deck' at the back so they were not fully private... this opened onto a void shared by all the cabanas, so you could sometimes hear people in the cabanas next door (especially if there were two travellers sharing a cabana and practicing for the mile-high club!). Oh, yes I have seen that article, I was more wondering, in the old lounge what was the availability of the cabanas like? Is it like getting a massage at the Qantas First lounge (0% success so far)? Or not that many people have the time to take a bath so its often free? So I have made it to the new Wing First lounge and it is indeed very nice. Disappointingly the restaurant offerings are very ordinary and no different to the old Lounge. No a la carte menu has been offered so can't say it is all that impressive. Didnt bother with the cabana but had a shower. Whilst the facilities are nice... Water splashes out onto the foot mat. The knobs for the shower are also placed against the far wall so you get a dosing of cold water from the rainfall shower head when you switch the water on. I've never understood why knobs aren't placed in a more sensible position so yet hat doesn't happen. There is also no bin in the shower facility. Water pressure was good. 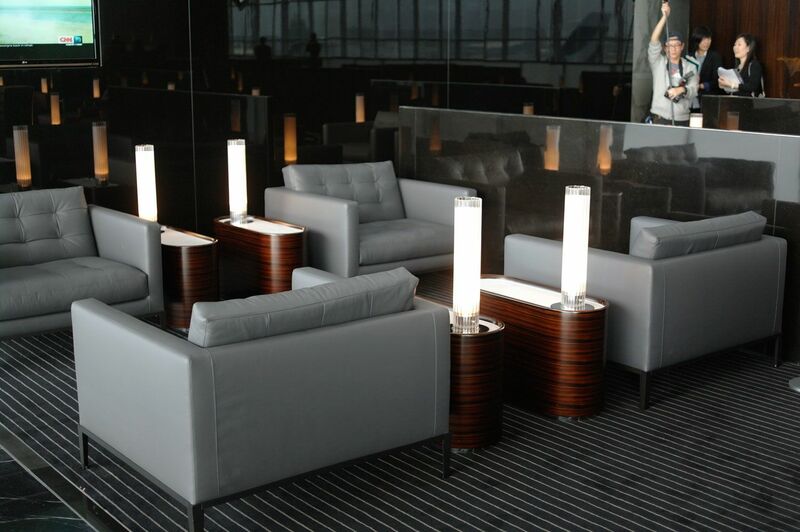 The Qantas First lounges in Sydney and Melbourne still out shine this lounge in my opinion. 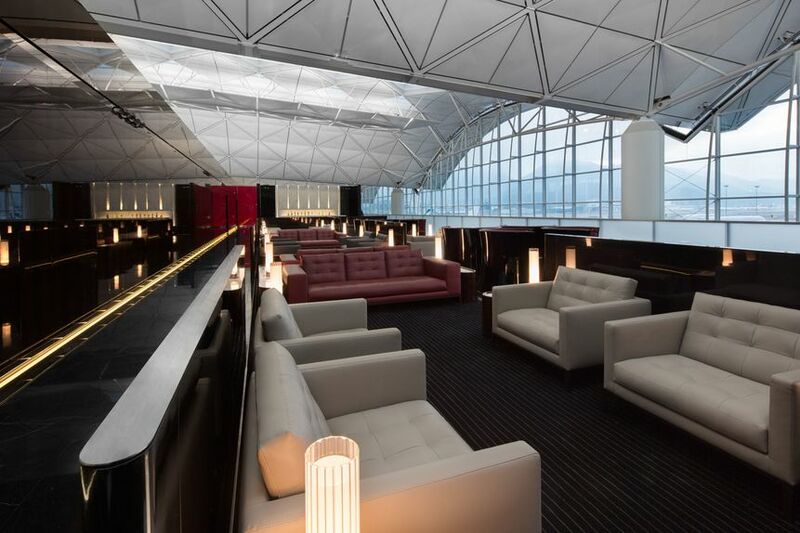 Comment on "First look: New Cathay Pacific Wing First Class Lounge, Hong Kong"